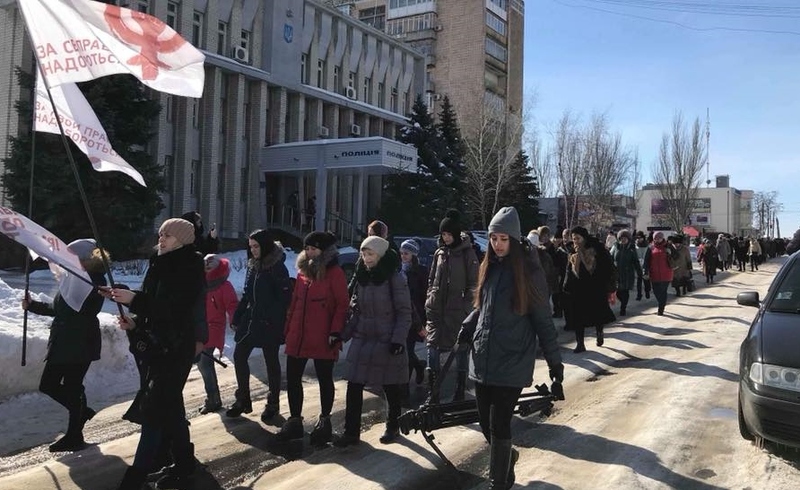 About 100 women took part in a “march for women’s rights” last week in Lisichansk, close to the front line between Ukraine and the Russian-supported separatist “republic” in Lugansk. “We need to fight for our rights!” was the main slogan of the march, on Tuesday 6 March. think that there’s no need to prove to those active women of Lisichansk, who took part in our march, what rights exactly we are fighting for! On Friday 9 March Vera Yastrebova, one of the organisers, reported on the Lisichansk event at a meeting of the Ukraine Solidarity Campaign in London. Vera, a lawyer, was there with Lisyansky, who gave an account of human rights violations and attacks on labour rights – and on activists’ responses to them – on both sides of the front line. Vera explained to the London meeting that the march for women’s rights in Lisichansk was the outcome of more than two years of campaigning work. Asked what “attacks on womens’ rights” meant, she recounted that defining the concept of women’s rights had been at the centre of the campaigning work. and conditions – women suffered these but did not always see them as attacks on their rights as women, as attacks on their human rights. But the campaign is aimed at changing perceptions. Success has been mixed, Vera said: for older women, changing the ways of looking at these things is sometimes tougher. 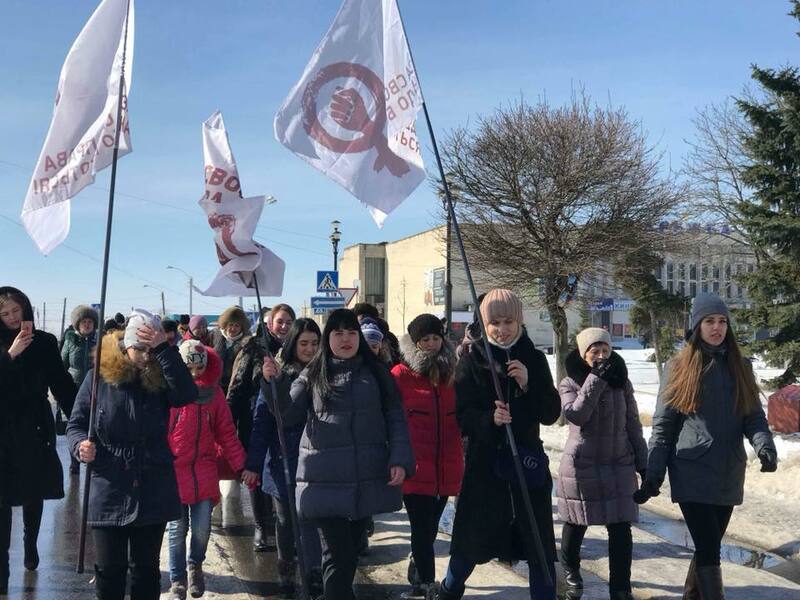 ■ The Womens’ Human Rights Group, formed in 2017 in Privol’e, Novodruzhevsk, Lisichansk and Gorskoe on the initiative of Irina Nikulnikova, a lawyer and mother of three children, who had worked for the coal company Lisichanskugol for ten years. “For the last two years [Irina] has not been paid her wages, despite having three young children. She left the [state-owned] company that was not paying her, and decided to find other work, but many of her colleagues remained there”, Pravozashchitnik reported. ■ The Lisichansk Human Rights Defence Group, formed in 2016 in Lisichansk, which focuses particularly on supporting students and young industrial workers. Pravozashchitnik reported that it is led by Vladislava Nikolayevskaya, “who decided to take action after her father was unlawfully laid off from the D.F. Melnikov mine, owned by Lisichanskugol, and did not receive wage payments for almost a year. ■ The Civil Inspection of Labour group, formed in 2014 in Debaltsevo to defend labour rights, social and economic rights, and the rights of women and students. The group was formed by Vera Yastrebova, who was forced to leave Debaltsevo during fierce fighting there in 2014 and who has fought more than 100 cases by refugees from the city. This resurgence of activity in the front-line communities is inspiring and important. War is a means of social control, of demoralising and terrorising communities. It can leave them defenceless against elites. Since the Russian-supported military action in Ukraine started in 2014, in Russia itself state action against activists and oppositionists has been stepped up, accompanied by an intensification of crude nationalist propaganda. In Ukraine, an analogous upsurge of ultra-nationalism has led to a spate of physical attacks on trade union, anti-fascist, feminist and gay rights demonstrations. But war can also provoke a fight back. That is the significance of the new forms of organisation taking shape in the front line communities. GL, 11 March 2018. 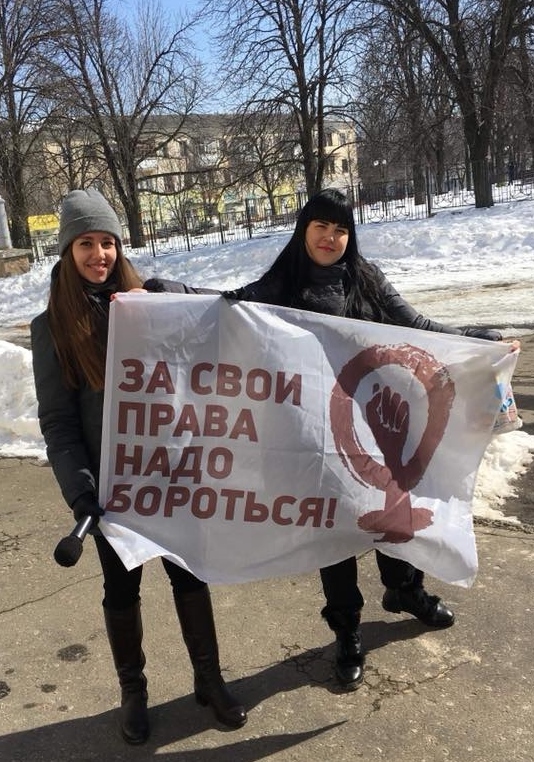 And another thing (13 March): feminists demonstrating on International Women’s Day in Kyiv were attacked by ultra-right-wing nationalists, while the police stood and watched, intervening only when the violence had already started. There’s a report on Vektor Media here. ■ In Syria, where Russian-backed violence is being used to crush families and communities on an even greater scale than in Ukraine, women continue to fight back – for example in Families for Freedom, which issued a statement on 8 March that began: “We are women behind the Families for Freedom, a movement to free our loved ones and thousands of others arbitrarily detained and forcibly disappeared in Syria. On this day dedicated to women, we mark and celebrate the resistance of Syrian women who have remained steadfast in the face of so many challenges: from the burdens of bombardment, forced displacement and the loss of our loved ones.” Read the rest on their facebook page here. This entry was posted on Sunday, March 11th, 2018 at 10:21 am and is filed under Social and labour movements. You can follow any responses to this entry through the RSS 2.0 feed. You can leave a response, or trackback from your own site.